PACNY is pleased to present a Preservation Merit Award to Kate Auwaerter for her advocacy for historic resources in our community. Kate Auwaerter represents the strongest voice for historic preservation within our local government. 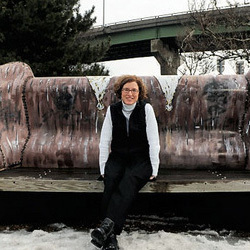 In addition to providing oversight to the City’s Landmark Preservation Board, Kate has pursued grants, funding, and partnerships to undertake comprehensive surveys and City Landmark/National Register nominations, including the Scottholm neighborhood, the former Village of Danforth, the Syracuse Downtown Commercial Historic District, and the former Village of Salina. Kate has provided effective leadership, fund-raising, and support for preservation efforts such as Save 711 East Fayette Street (dedicated to preserving and rehabilitating the former A.M.E. Zion Church). In short, Central New York owes Kate Auwaerter a great debt for her role in preserving important resources in our community. PACNY sincerely appreciates Kate Auwaerter’s tireless pursuit of grants, funding, and partnerships to identify, preserve, restore, and promote historic resources in the region. In addition, PACNY is indebted to her significant help organizing the Sacred Places Symposium in 2013. 2014 PACNY Award Feature #5 – Downtown Committee of Syracuse, Inc.
PACNY is pleased to present a Preservation Merit Award to the Downtown Committee of Syracuse, Inc. in recognition of the organization’s ongoing service to our community by promoting the economic revitalization, beautification, security, and preservation of the built environment in Downtown Syracuse. The Downtown Committee’s significant recent contributions to the preservation of local historic resources include: funding and preparation, in partnership with the Onondaga Historical Association, of the Historic Walking Tour of Downtown Syracuse; National Register nominations for the Armory Square Historic District (1984), South Salina Street Downtown Historic District (2006), and the Downtown Syracuse Commercial Historic District (2013); partnership and advocacy for numerous Historic Preservation Tax-Credit funded projects; and celebrating the historic character of downtown and promoting the reuse of historic buildings by featuring the architecture and historic building stock in recruitment videos and television commercial campaigns. 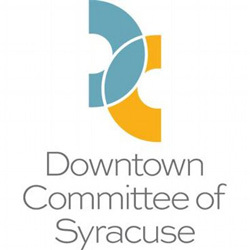 We appreciate the Downtown Committee’s support of commercial development and the residential renaissance of Downtown Syracuse, which contributes to the vitality, physical condition, and preservation of the unique and impressive architectural legacy of our region’s core. PACNY is pleased to present a Preservation Merit Award for the Stevedore Lofts project, which is an impressive and significant adaptive reuse of the former Standard Yarn Company woolen mill and warehouses in the City of Oswego. The former Standard Yarn Company mill and warehouses, listed on the National Register of Historic Places, were built in three stages between 1897 and 1911 and represent one of the few remaining mills on the Oswego River. Renovation of this National Register listed property was conducted in close consultation with the State Historic Preservation office and has resulted in a vibrant mixed-use building located on Riverwalk Park with 29 market-rate apartments with commercial and office space on the ground floor. 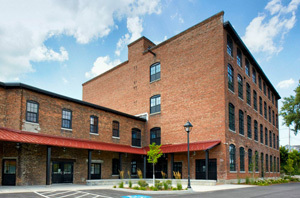 PACNY congratulates the Stevedore Lofts, LLC partnership – Ted Kinder, Robert Medina, Tim Stitt, and Larry Clark – as well as MacKnight Architects, MCK Building Associates, Sutton Companies, the City of Oswego, the Oswego County Industrial Development Agency, and a Restore NY Grant on the renovation of this major asset for the City of Oswego.